Photo by Jang Hyun-Woo on Nov. 11/ ‘The blue-roofed housed are inferred to be the residential buildings by workers.’ See Jang’s more photos of construction site where destruction is being done in thorough violation of the EIA, see here. 1. Workers’ sabotage? Not confirmed yet. There have been no night time entry/ exit of cement mixer trucks since last Saturday, Nov. 10. Even though it is told that 24 hour construction is continued inside the construction site. As of Nov. 16, it became a week that cement mixer trucks did not enter or exit the gates in the nights. The police would withdraw from the field in the evening and people could fortunately take break in the nights. On Nov. 16, the last struggle in front of the construction gates was at around 5:40 pm since there were no more trucks and police withdrew after it. What’s happening? Is it just a part of normal process for caisson production that needs care period by the next caisson production? Or are the police tired to be mobilized in the nights since they think the navy is crazy, too, to rush for the construction even in the nights? There is information that needs much more factual check. So this is just for reference. According to information that should be checked in various aspects, it is told that the Korean workers inside the construction site are sabotaging, intending to rebel against unfair work management. It has been known that about 100 workers from Vietnam and other countries have entered into the naval base construction site in the village just before 24 hour construction (destruction). We could imagine their poor work conditions, exploited with low wages. And it seems Korean workers are also exploited, which should be never surprising news. According to information, the navy-contracted companies hiring Korean workers laid off them after the workers were mobilized to teach Vietnamese workers how to work. In the morning of Nov. 16, peacekeepers in the protest field were told that the construction company unilaterally laid off 18 workers. A laid-off worker coming out of the site told people. Beside 18 laid off Korean workers, it is told that some Vietnam workers quit the jobs that morning because they felt so cold to stay inside the containers in the coast within the construction area. Regarding 18 laid-off Korean workers, they are workers all working with reinforced rods. There were originally 30 workers working with reinforced rods and now 12 workers are left. The company has made two caissons and the 3rd caisson has been posed in process. It is told that Vietnamese workers would fill the empty job spots. While the daily wage of a Vietnam worker is 60,000 won, a South Korean worker gets 150,000 won, it is told. The Korean workers are told to wonder why such so-called important national policy project is built by foreign workers and why the Vietnamese workers often take records of photos on construction site with their mobile phones. 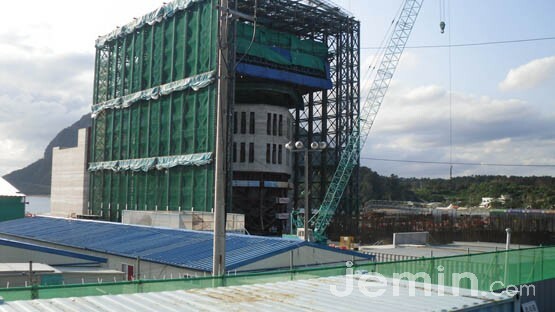 It is told that while the director of the field is the one who has worked in Hwasoon, the workers here in Gangjeong construction site are employed by the Daelim-subcontracted company called the Jeju T & C, of which the headquarter is told to be in Seoul and which they have never been informed before. The workers were employed from all over the country and there is no specific leader among them. The workers have originally been told from the construction company that they would get 4 million won for a month for two years with the job. But the 18 laid-off workers could not get any dismissal allowance since their work term was less than two months. According to the Ministry of Labor, dismissal allowance is given to workers of more than three months. To be worse, they could not get wage from the companies yet. It is told that the companies said to them that they would send wage through their bank accounts later. Update on Nov. 17: It is told that beside the Korean workers who are told to have intended strike, Vietnamese workers are also in the mood of organizing strike. It is clear the caisson work inside the naval base construction site in the Gangjeong village is not being processed well. Even during the daytime on Nov. 17, Saturday, there were no more cement mixer trucks entering after 3:30pm. The police withdrew at the time. It is unusual considering that construction (destruction) has been going on by late evening on Saturday even before 24 hour construction. Also, it is told that the employees of navy-contracted security companies are complaining on illegal registration of companies (* for that, see page 4, Nov. newsletter) and delayed payment of wages. They are in the move to file a suit on unjust employment to the Ministry of Employment and Labor. Still despite such already exposed unjust construction including unfair work conditions, on Nov. 17, the Seogwipo City Hall, being pressured by the navy, sent a notice to the villagers that if the villagers are not volunteering to remove their sit-in tents across construction gates, it will carry on forceful execution of demolition of them. The villagers and peacekeepers are ready to fight to save the sit-in tents next week. It also became clear that the residential households nearby the construction site in the Gangjeong village are suffering for the noise during the night time construction. One resident told that she felt like in the hell when she heard the noise of crane during the night. There is not only a matter of work conditions for workers. The 24 hour construction to build 8,800 ton caissons in Hwasoon port (40 minutes car distance eastward from the Gangjeong village) has already been complained by the nearby residents. 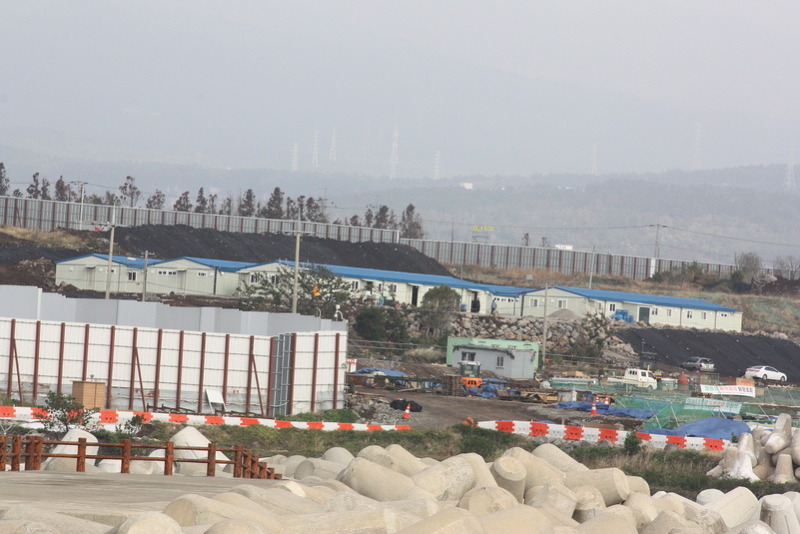 The residents in Dongha-dong and Ungeun-dong, Hwasoon-li, Andeok myeon (* myeon (township) is the subdivision of gun (county)), in the Seogwipo city are being damaged by the construction noise related to the production of caissons that are put in the naval base construction area in Gangjeong village. The residents are especially protesting to Samsung C & T, saying they are experiencing discomfort because of greater noise in the nights as the caisson production is being done for 24 hours. The residents have demanded to the Samsung C & T to stop construction from 10pm to 5am and to take prevention measures to reduce the damage by noise. However, the position of the Samsung C & T is that it must progress construction even in the night time, reasoning that the caisson production needs unstopping construction due to technical matter; that there would be problem in quality management if construction is stopped in the night; and that the construction period has been delayed for several months. Eventually there have been meetings in last September and at the end of October, by the related personnel to solve the civilian complaints on construction noise by the caisson productions, for which local residents, contracted company personnel, and government officers in the Seogwipo City and Andeok Myeon joined. However, solution measures have not been provided yet. Kim Tae-Un, Chairman of Hwasoon li stated that “The residents nearby the construction site are being harmed not to be able to sleep again if they woke up from sleep due to abrupt noise occurring from the cranes in the dead of night… Even though we have raised noise issue from the beginning of this year, it has not been properly settled. And the residents are now standing up against it”.